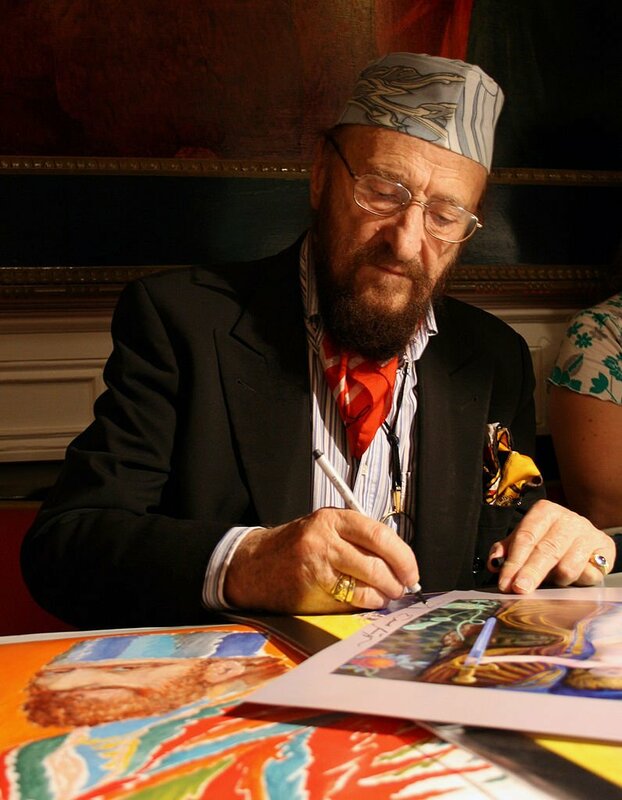 Austrian artist Ernst Fuchs, co-founder of the Vienna School of Fantastic Realism, has died at the age of 85. The painter’s son, Tillmann Fuchs, said his father died on November 9 but gave no cause of death. Ernst Fuchs was renowned for his brightly colored works that combined allegorical and religious themes. He was also a talented sculptor, architect, stage designer, composer, poet and singer. Ernst Fuchs was also known for his unique personal style of a full beard and patterned caps. Born in Vienna, the artist was the only child of a Jewish antiques dealer and a Catholic seamstress. He was baptized as a Catholic during the Nazi era to escape the Holocaust and his work over his career increasingly focused on religious symbolism. Ernst Fuchs’ most famous painting was the large-scale Last Supper, which he started after visiting the Dormition Abbey in Jerusalem in 1957. His talent as an artist was spotted early and, at the age of 15, he was accepted to study at the Academy of Fine Arts in Vienna. There he met fellow students Anton Lehmden, Arik Brauer, Wolfgang Hutter and Rudolf Hausner. Together they founded the artistic movement known as the Vienna School of Fantastic Realism. All studied under Professor Albert Paris Gutersloh. The professor emphasized the techniques of the Old Masters in order to give clarity and detail to their work, and the use of allegory and religious symbolism. Ernst Fuchs was also influenced by the Austrian symbolist artist Gustav Klimt – painter of vivid and textured works such as The Kiss – and Fuchs himself became renown for works that emphasized texture as well as color. He revived the traditional mixed technique, using egg tempera to build volume, and glazing it with oil paints mixed with resin to create a sparkling effect. Ernst Fuchs moved to Paris in 1950 and lived there for 12 years, during which time he travelled to Italy, Spain, England and the US. The trips brought him into contact with artists such as Salvador Dali, Giorgio de Chirico and Jean Cocteau, with whom he became good friends. Ernst Fuchs returned to Vienna in 1961 and started writing about the art of painting, producing several books. By the mid-1970s he was a sought-after opera stage director and designer, working on productions of Mozart’s Magic Flute and Wagner’s Parsifal and Lohengrin. In 1972, Ernst Fuchs bought the derelict former home of the 19th-Century architect Otto Wagner villa in Hutteldorf. The artist restored and transformed the home and it later became the Ernst Fuchs Museum.